The “Stone Soup” luncheon creates awareness of the need for food in Oswego County. Held annually, in fall and spring, the United Way’s Stone Soup Luncheon helps to support food pantries throughout Oswego County. Local pantries are finding it difficult to keep their shelves filled and prove it to be especially challenging as they struggle to meet the increased demand for food subsidy in Oswego County. 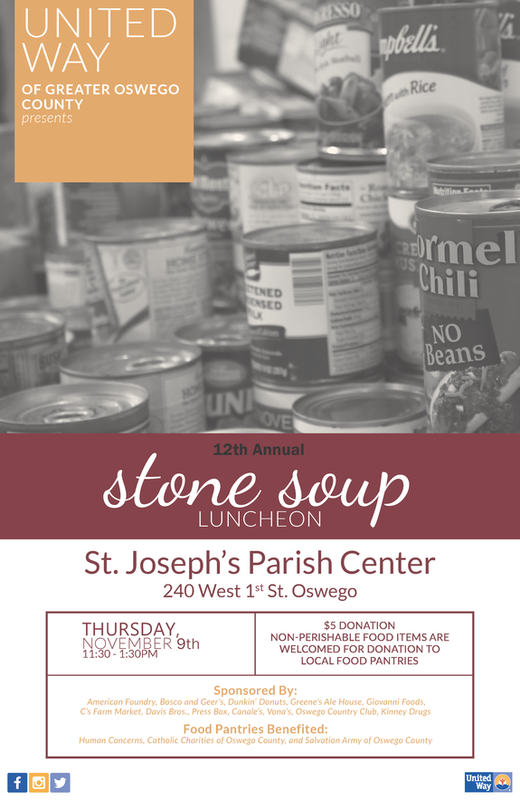 The Stone Soup Luncheon event raises funds and collects non-perishable food items at the November event in Oswego for 3 local food pantries: Human Concerns Center, Catholic Charities of Oswego County and Salvation Army of Oswego County. Stone Soup, Too held in Fulton every March, also raises awareness and non-perishable food items, which are donated to the food pantries of Catholic Charities of Oswego County, Salvation Army of Oswego County and the Hannibal Food Pantry. Stone Soup is an event that provides results in one of our community impact areas: Stop Hunger. We do our part to raise awareness of the food shortage in Oswego County and encourage the community to help fill the shelves of our local area food pantries.